Brescia has very old Celtic origins; it was a loyal and powerful ally of Rome, later a rich and proud Medieval Comune, and then a refined and learned Venetian town of terra firma. Brescia is especially bound to the history of the Lombards, who made it one of their most important Italian centres and a place of integration with the ancient resident peoples. For two centuries Brescia was the seat of one of the most important Lombard duchies and provided the kingdom with influential officials and important kings such as Rotari and Desiderius. 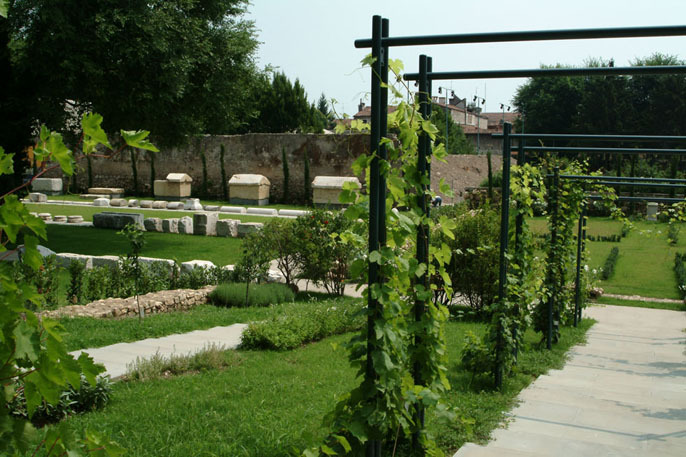 “A garden in the monastery of San Salvatore in Brescia”. This is the opening of Act 4 of Adelchi, the great tragedy in verse written by Alessandro Manzoni. “Here in the shade of the linden, here … still breathing the gentle breeze of the Mella”. These are the words that Ermengarda, the daughter of the Lombard King Desiderius and wife sacrificed by Charlemagne for sake of the State, addresses to her young maids and to her sister Anselperga, the abbess of San Salvatore, while they are sustaining her in the seclusion of the cenoby in Brescia. Rotari, at first duke of Brescia, then Lombard king from 636 to 656 AD. is well-known for the promulgation of an edict, written in Latin, which was named after him. The edict was issued in 643 AD. and it represents the first organized code of laws, composed of 388 articles, written after the decline of the Western Roman Empire and the subsequent dreadful barbarian invasions. The purple parchment belonged to the treasure of Santa Giulia where it was named as “Queen Ansa’s breviary”. The central part of the manuscript, dating from the mid-6th century, was commissioned by the Emperor Theodoric in Ravenna.